The real history behind Mary Ellen Pleasant, San Francisco's "voodoo queen"
She was one of the richest and most powerful people in the state — and she was a black woman. Mary Ellen Pleasant was a real estate innovator and millionaire, a socialite — and an abolitionist known to the black community as "Black City Hall." Yet today this extraordinary woman is mostly remembered through tall tales about San Francisco’s so-called "voodoo queen." Why this change of focus? Our first clue is at the last stop on a city tour called the San Francisco Ghost Hunt. "Her life is still a mystery"
“If they decided she was an escaped slave and she had no freedom papers, they could just wrest her off the streets and back into slavery," Bibbs says. Her skin was fair enough to pass, so when she docked in San Francisco in 1852, she arrived as a white woman. Pleasant was ambitious. She stepped onto the muddy, smelly embarcadero wearing a matching black dress and bonnet and immediately saw her business opportunity: young men’s boarding houses. Most men, from broke gold miners to rich politicians, lived in crowded flophouses. Pleasant built the first boarding houses for high society men. She hosted luxurious balls and elegant dinners. She brought a little class to the lawless frontier. Between the several boarding houses she owned and other financial investments, Pleasant amassed a million-dollar fortune by 1865. “She ended up having the most exclusive boarding house in San Francisco," Bibbs says. That's how she accessed the elite inner circles in the city. Even the governor lived there. He took his oath of office in her boarding house on Washington Street. Bibbs says she knew how to create loyalty in these men. “A lot of people said she used blackmail," she says. "Well, she did use blackmail at times, but that wasn’t the source of her power. The source of her power was gratitude." While she was becoming an influential figure in the city, Pleasant was living as a kind of double agent. 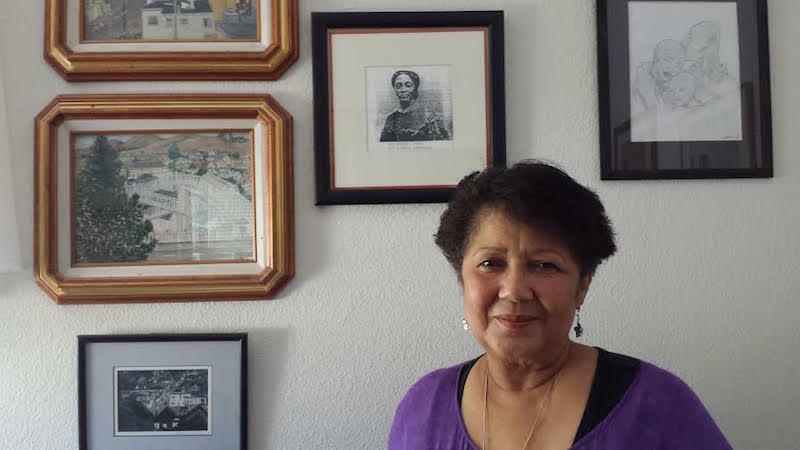 While most of San Francisco knew her as white, the black community knew that she was black — and fighting for abolition. She was a major link in the Underground Railroad, a funder of slave revolts across the country and a pillar of the burgeoning black community in the city. Pleasant got them housing, jobs, loans, legal charges dropped. She made it popular for high society to hire black people. She was determined to make it big and bring her people with her. In 1865, Pleasant decided it was safe to stop passing as a white woman. For the first time, she checked “black” on the census. But there were consequences for fighting white supremacy. In the late 1800s, white San Francisco begins to see her not as an insider, but as a villain. Here's the context. The U.S. was struggling to reconstruct itself after slavery and had fallen into an economic depression. It was “a time when horrible things began to happen for African Americans,” Bibbs says. Newly freed slaves were scapegoated for the downturn. Politicians in favor of civil rights were being replaced by segregationists. The KKK rose to power. Mary Ellen Pleasant becomes a cautionary tale for the country: This is what happens when you let a black woman get too powerful. Lynn Hudson wrote a book about Pleasant. She says rumors filled the papers. She says the press tried to cut Pleasant down to size by giving her the nickname "Mammy Pleasant," a name that “conjures images of the smiling, happy slave with a hankerchief on her head and she’s so happy to be a slave,” Hudson says. Some reporters mocked Pleasant by portraying her as harmless and subservient. Others painted her as a powerful witch. This was an era when reporters played fast and loose with facts, and there were no repercussions. The San Francisco Chronicle spread rumors that she was a madame, that she stole white people’s money, even that she stole babies and sold them on a black market. The papers fixated on Pleasant’s voodoo practice. According to Bibbs, she did practice voodoo — or rather, vodun — the Haitian religion her mother and grandmother passed down to her. She was trained as a vodun priestess, a role which tasked her with protecting and serving her community, the black community of San Francisco. The press ran with it. Think of it, a voodoo queen. The perfect tabloid spectacle. Yet Pleasant never cowered from the press, or anyone else. She mocked the negative media attention and even played into it. She carried around a crystal ball as a prop. So she carried on as the "Voodoo Queen" until the day she died in 1904 from heart failure. Her whole life, Mary Ellen Pleasant was fugitive by virtue of her skin color and wicked by virtue of her gender. But Bibbs won’t let that be her legacy.